Celebrating Fiji Airways' new route between Nadi and San Francisco, chef Lance Seeto created the country's first ever gourmet standard pop-up restaurant by the 15th hole of the famous Denarau Golf & Racquet Club, much to the bewilderment of golfers. Affectionately dubbed the Neil Perry of Fiji, Seeto is renowned for his award-winning restaurants, weekly newspaper column and airline culinary ambassadorship. However at age 50, Seeto perhaps has more in common with celebrity chef Jaimie Oliver these days. Just like the famous British chef, Seeto has enjoyed a successful television series and has a book on the way, but it's his mission for health that has him being compared to Oliver. Seeto has taken it upon himself to improve the standards of cooking, health, diet and life expectancy of the Fijian people. Seeto's crusade centres around Fiji fusion which is a unique blend of traditional Fijian, Fijian Indian, Chinese and modern Australian cuisine. In fact Seeto himself is a bit of a fusion, born to Cantonese parents in Papua New Guinea and growing up in Melbourne before working in some of Australia's most famous tourists resorts in Western Australia, the Northern Territory and Tropical North Queensland. Arriving in Fiji in 2009, Seeto was feeling jaded and only planned to spend a few months in the islands before taking on work in China. Yet the place captivated him and he now considers Fiji home. Seeto is the first chef to win Best Fine Dining Restaurant according to Tourism Fiji two years running (2013,2014) for his work at Castaway Island in restaurant 1808. Last year he moved to rival resort Mana Island and by September he will have opened three signature restaurants at Mana Island Resort. Taking a holistic approach to food, the Kura Spa Cuisine Cafe will serve 'restorative cuisine' drawing inspiration from the medicinal properties of traditional Fijian food. The unique Nasu will offer the first fusion teppanyaki in Fiji, putting a Fijian twist to the traditionally Japanese cooking method replacing miso with fermented coconut and cassava. Another first, WAR will be the only restaurant in Fiji that focuses on cooks working on a traditional elevated fire pit. 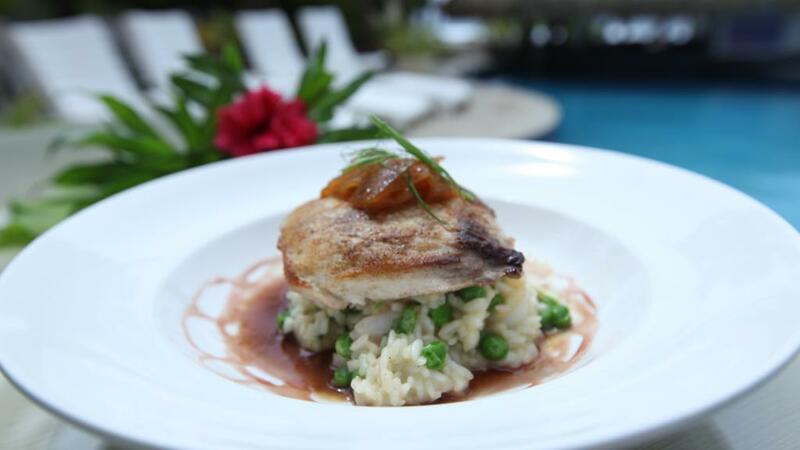 Yet neither Seeto's Fiji Times column or Taste of Paradise TV show are aimed at gourmet cooks. In fact just the opposite, Seeto simplifies his cooking and uses healthy foods so that the reader or viewer can feel comfortable using the ingredients and equipment they've got to create a delicious, healthy meal. Both are aimed to offer practical, everyday cooking ideas with basic ingredients. Given its heavy use in the traditional Fijian diet, coconut is always at the heart of his cooking and Seeto presents a message of health all the way through.